David Moore and his esteemed coauthors transformed educational statistics by writing texts that elevate systematic ways of thinking about data over mere techniques and formulas. This philosophical principle of analyzing data and emphasizing ways of thinking over techniques and formulas is the underpinning of each of text. The authors present methods of basic statistics in a way that emphasizes working with data and mastering statistical reasoning, problem solving (rather than on methods), and drawing conclusions from data. Lastly, real data -- not realistic data – both engages students and enables students to experience actual patterns (or lack thereof). 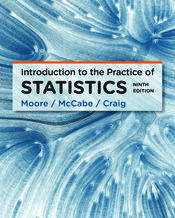 Basic Practice of Statistics has step-by-step instruction to guide readers through the problem-solving process. Part of this is the 4-step guide or heuristic introduced to help work through problems. Practice of Statistics for Business and Economics teaches essential introductory topics, heavily emphasizing inference from data, across examples and exercises from business- and economics-related fields. Statistics: Concepts and Controversies presents statistics to “nonmathematical” readers as an aid to clear thinking in personal and professional life. The focus is on statistical thinking. Practice of Statistics in the Life Sciences teaches essential introductory topics in the context of the life sciences, drawing examples and exercises the fields of nursing, public health, and allied health.